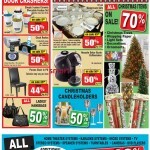 Here is the Hart Stores Boxing Day Flyer full of their Boxing Week Sales and Deals Canada 2013. 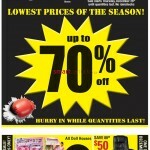 Hart Store’s Boxing Week Blow-Out from December 26th to January 6th! All Christmas items will be on sale for 70% during the holiday. This includes trees, wrap, lights, decorations, and ornaments. Save an additional 20% on all home theatre systems, karaoke machines, micro systems, TVs, stereo systems, speakers, turntables, cameras, and DVD players that are already up to 60% off! 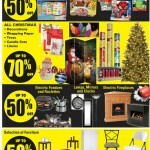 Giftware will be on sale anywhere between 25% and 50% off. 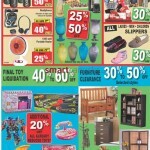 Final toy liquidation at 40% to 60% off and an additional 20% off already reduced toys. 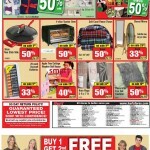 Furniture clearance will be between 30% and 50% off on select styles. 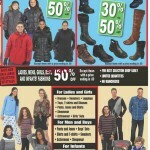 All winter jackets are 50% off and all winter boots are 30% to 50% off (excluding items that end with .00 prices). Ladies, Men, Girls, Boys, and Infant Clothing will be up to 50% off! Buy 1 and get the second 1 free for all items with .00 price endings. 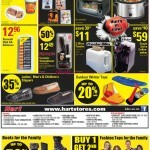 Hart is also offering a 90 day price guarantee – they will be price matching competitors for identical items. Show the ad and receive the exact same pricing.